How to Finish a Lengthy Management Assignment Overnight? 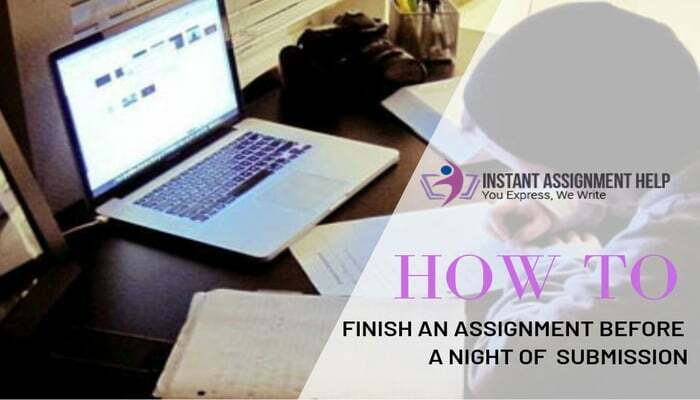 No doubt it has happened with you many times that it’s 9:00 P.M in the night and there is an assignment due tomorrow, and you haven’t started yet. Well, this the last stage of procrastination and you can’t afford to waste anymore time. You have already crossed a few stages, such as false fear: the belief that there is no assignment due. It generally occurs when you have plenty of days to complete your work. The second one is laziness, where you just start feeling that you should start writing. The next one is excuses: where you try to explain to yourself that you have better things to do. The fourth one is denial: where you believe that ahhh... I still have too much time to finish this. And, now as you’re in the last stage, time passes quicker. You will start panicking, and experience anxiety and stress. Well, you don’t have to worry anymore about it. Here, we have listed the best tips which are very useful and can easily get your assignment done in the shortest possible time, if followed properly. There is always difficult to stay away from those things which give you fun and relaxation, but at the time of writing a management assignment, they act as distractions. So before writing, you must eliminate them. Well, there is a button to switch off your phone. However, it’s always difficult to press that. Well, if you can’t switch off your phone, then put your phone on silent and keep it a little far. It will kill your temptation to check it regularly. There is an app in the Play Store called “Self Control.” It allows you to create a blacklist of a few websites which you don’t want to visit for a certain period of time. And, the best feature of this app is that it’s irreversible. Uninstalling the app or shutting down the system can’t unblock the sites till the time limit you have set. Generally, research consumes a lot of time. When you have to write on any complex or technical topic, it’s very important to carry out extensive research. If you don't do that, then you will end up with lack of ideas. Suppose, if you have 10 hours to write, spend 5 on research and the rest 5 in writing. By this, you will get enough ideas in your mind to present on the paper. You won’t feel like you are lacking points to write. But, if you have to write any narrative assignment, then it’s not necessary to do in-depth research. 2-3 hours are enough, spend the rest on writing. Because in such type of assignments, you don’t need to invest too much time in research, so it’s pointless to waste on it. Rather utilize it somewhere else, such as in editing or proofreading. Write, write, and write. This is the only thing that can let you complete your lengthy management assignment overnight. Write down all the information that you have and later, edit it. Because it will consume more time if you will write a single sentence and start editing it, so it’s to better write the whole content and then go through it. This will be helpful because it often happens that you have good ideas in mind, but due to being engaged in editing, you forget them when it comes to writing them. So, if any idea pops up in your mind, write it down immediately anywhere and later include it in your document. In such a short period, it is better not to waste your precious time in trying to remember the things. So, that’s all to get your assignment done overnight. Stay away from the distractions, gather the relevant data, and start writing. Don’t stop. But, the question is that why is there need of being an owl? Attend your classes and manage your time appropriately to complete your task in the daytime and sleep peacefully at night Well, if anything else like the poor writing skill or lack of subject knowledge is causing a hindrance in your way of writing management assignment, then seek assistance from us. Our management assignment help writers will provide you with the best solution within a very quick period.